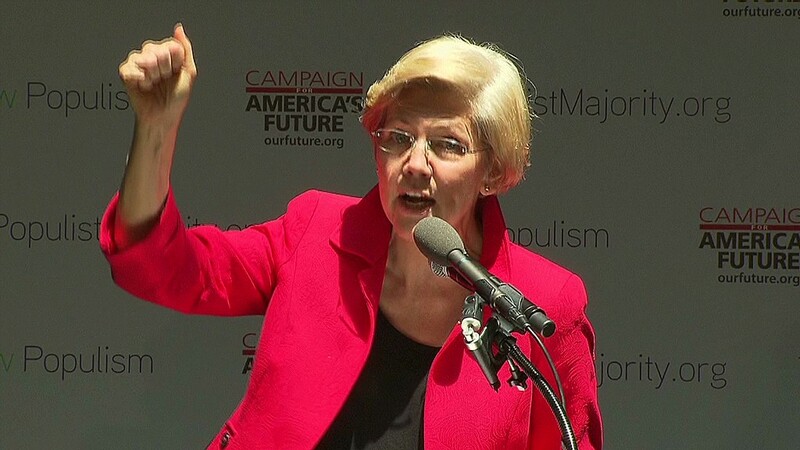 Sen. Elizabeth Warren wants Congress to look into allegations the New York Federal Reserve blocked one of its own from criticizing Goldman Sachs. The allegations were made Friday and are based on what appear to be secretly-made recordings of meetings between a Fed investigator and her colleagues. The investigator, Carmen Segarra, was fired but in 2011 and 2012 was assigned to monitor Goldman. Two news outlets that received the tapes, This American Life and ProPublica, reported they showed Fed officials pushing back on her efforts. Sen. Elizabeth Warren at a recent hearing. Warren said the tapes raise "disturbing issues" and that hearings are necessary "because it's our job to make sure our financial regulators are doing their jobs." The tapes are also part of Segarra's lawsuit against the Fed for wrongfully firing her after just seven months. The New York Fed said Friday it "categorically rejects the allegations being made about the integrity of its supervision of financial institutions." It added her dismissal was based "entirely on performance grounds" and that her concerns "were taken seriously and escalated by senior members of the team." Goldman pushed back on her view that it did not have a proper conflict of interest policy. It also said she had previously applied for jobs at Goldman but been turned down. At the time Segarra worked for the Fed, Goldman was under scrutiny for advising a financial deal while also owning a significant stake in one of the companies. This isn't the first time Warren, a Massachusetts Democrat, has turned a sharp eye on both Wall Street and its overseers. She has pilloried regulators for being too lax and big banks for cheating their customers. She is often described as a consumer advocate, and prefaced her call for the hearing with the claim that sometimes "regulators care more about protecting big banks from accountability than they do about protecting the American people from risky and illegal behavior on Wall Street." Her Democratic colleague on the Senate Banking Committee, Sen. Sherrod Brown of Ohio, urged "a full and thorough investigation."